Most families spend a lot of time in the kitchen making it the heart of their home, so it is understandable that you want this room to look and function its best. 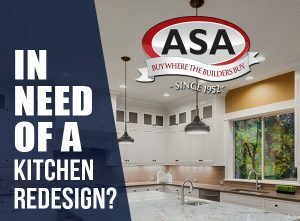 Whether you are ready for a complete overhaul or just need some updates such as new countertops or a backsplash, ASA Cabinets designers are here to help you out, explain the best products for your needs, and the current trends that will keep your kitchen looking magnificent longer. Top quality, reasonable cost and value, appearance (capturing your unique style) and functionality (optimally organizing the space available for convenience) are all important. ASA Cabinet’s expert and knowledgeable designers will break it all down for you, reducing your stress and creating some fun and excitement while designing your new kitchen with you.